Fondue Bouguigninne, well I only knew about this after comming to Belgium. Mostly we make it when we invite family just to have a get together and then if I don't want to prepare any dishes we do this as it is so easy. You need the foundue pot and you fill with oil keep in the middle of the table, and you have a plate full of variety of meat, salades,slices fresh tomatoes, slices cucumber, corn salade ,grated carrots and a huge variety of mayonaise like simple mayonaise, curry mayonaise, spicy mayonaise , tartare mayonaise, garlic mayonaise etc.... and thenn if I am in the mood I make a rice salade so the only work I have is to do all the vegetables and make some of the mayanaise and the plate of meat is ordered from the local butcher. As i mentinoed when I do fondue like this I invite family over but last saturday I planned to do just for three of us and I decided why not prepare the meat my self too. The main work if you don't order the meat platter from the butcher is to make the meat balls for the rest you just have to cut the pieces of variety of meat and then arrange on to a big platter. 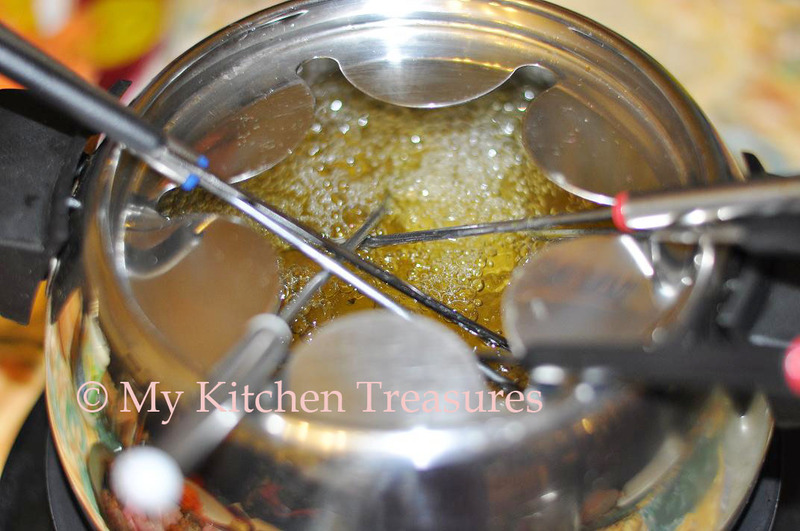 And the main reason for me to blog this recipe is my sister also do fondue after hearing it from me , but she makes the meat platter her self but never made the meat balls, so I thought as I am making anyway I will blog it for her as she is planning to do fondue this sunday. Fondue is a Swiss dish of melted cheese served in a communal pot (caquelon) over a spirit lamp (rechaud), and eaten by dipping long-stemmed forks with bread into the cheese. It was promoted as a Swiss national dish by the Swiss Cheese Union in the 1930s and became popular in North America in the 1960s. Since the 1950s, the name "fondue" has been generalized to other dishes where a food is dipped into a communal pot of hot liquid: chocolate fondue, where pieces of fruit are dipped into a melted chocolate mixture, and fondue bourguignonne, where pieces of meat are cooked in hot oil. 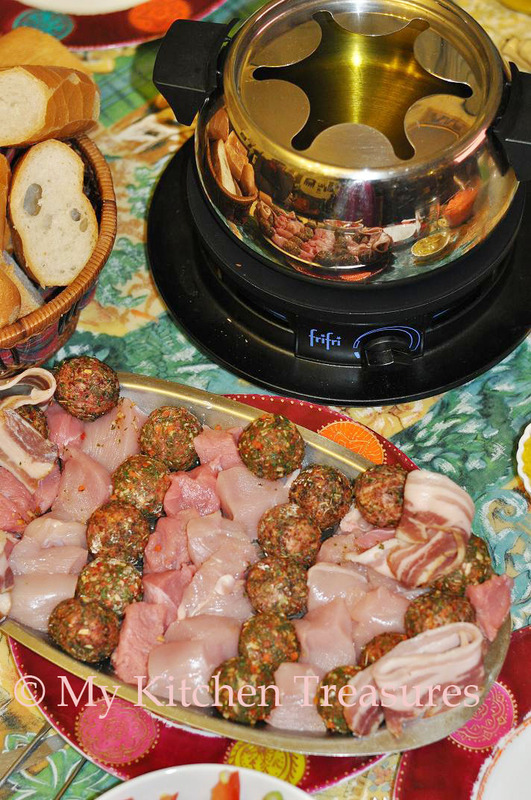 Fondue Bourguignonne consists of a fondue pot filled with hot oil into which diners dip pieces of meat to cook them. Various sauces are provided on the side. 300 gm Veal cut into chunks. Couple of sliced of bacon. 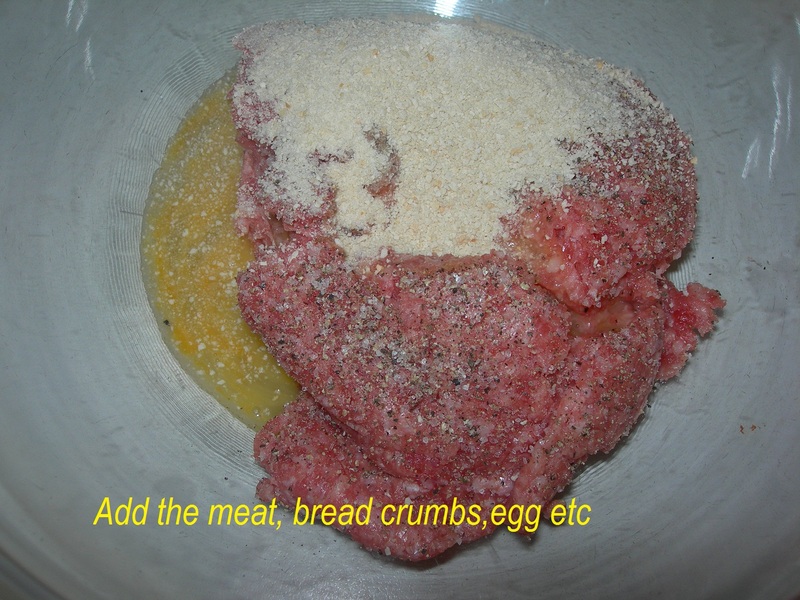 Salt to taste, take care as the spice mix normally have salt in it. I use spice/herb blend we get here to cover the meat balls. I don't know you get them were you are but I am sure in US it is available as my sis said she has it especially the American steak spice mix. 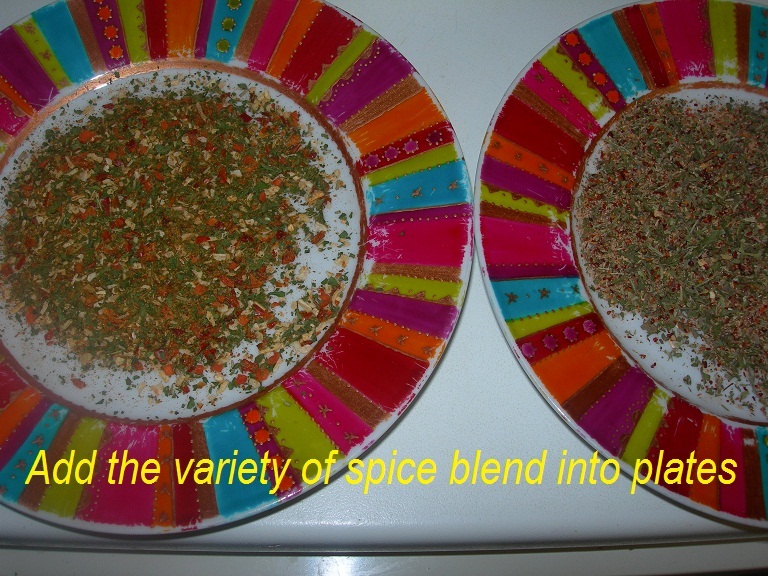 You don't have to use the spice mix i have used you can use what ever flavour you like. And if you don't get them I suggest you make a mix of herbs, salt, garlic powder, paprika powder,onion powder salt etc to make your own blend. Few tbsp Amrican steak spice mix. 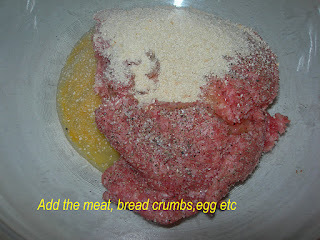 For the meat ball, add the mince in a bowl together with the peper,salt bread crumbs and egg. 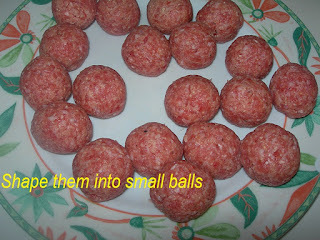 Now take small portion of meat mix ( a golf ball size) and make into balls, making sure that are well shaped and tight so that the balls don't break when you deep fry them in the oil later. 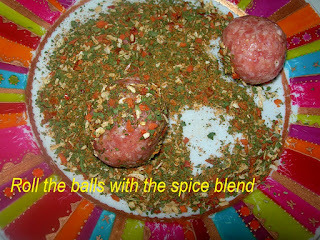 When all the balls are made, take a drop of oil and rub on each balls and then roll with the spice mix of your choice. 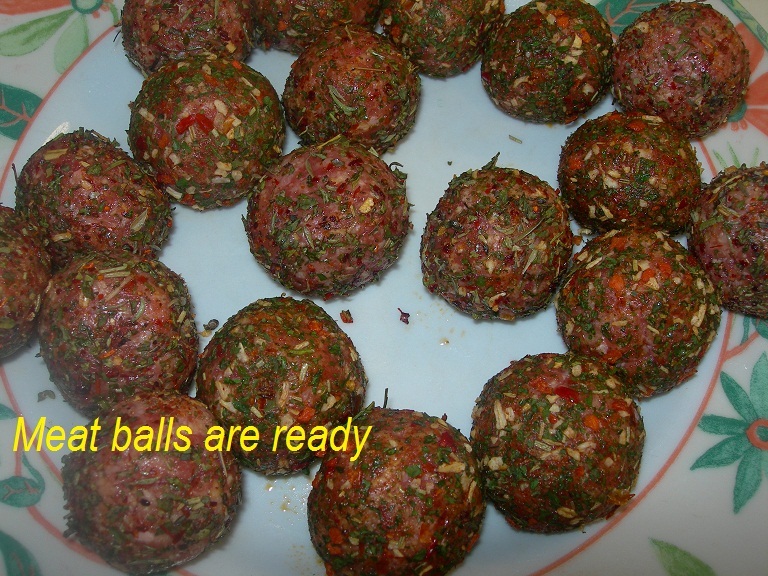 Keep the meat balls in the fridge atleast for 4 hours before you use them. 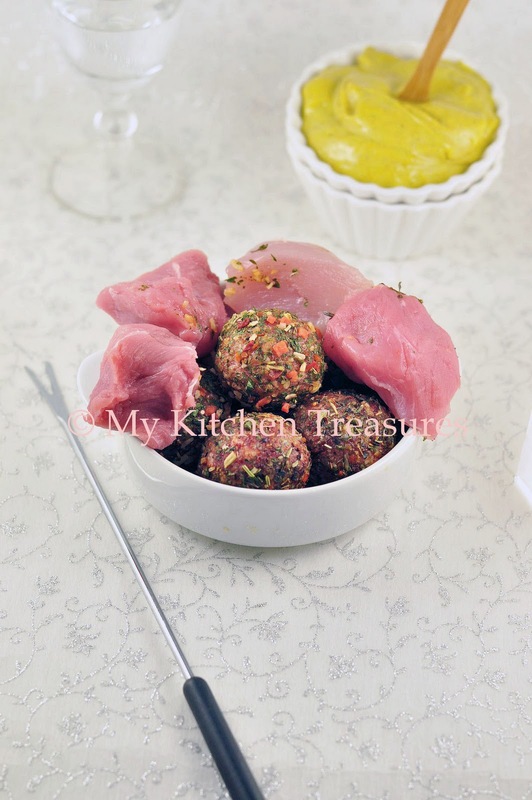 Now when it is time for having your foundue dinner, arrange the cubes pieces of meat and balls in a plate and layer inbetween or on the side bacon pieces. Heat up the fondue according to the manufactures instruction and when the oil is hot poke one piece of meat with your special fork and dip into the oil and fry for few minutes or how fries you want you meat to be. Enjoy with salade and mayo and with slices of baguttes. Sometimes here we just fry the bacon slices straight. We just curl it up and poke with the special fondue fork and fry or we wrap around the meat pieces the bacon and then fry. Yum yum, am inviting myself to you place,just love this kind of fondue..
yum! This would be so much fun for a dinner party!We had a pizza party recently where we made pizza from scratch with everyone's fav toppings and it was so much fun! I never tried with meat....but love cheese fondue and chocolate fondue!! Nice clicks! I only knew the chocolate fondue, that would be great that people make their own choice and do their fondue in party! 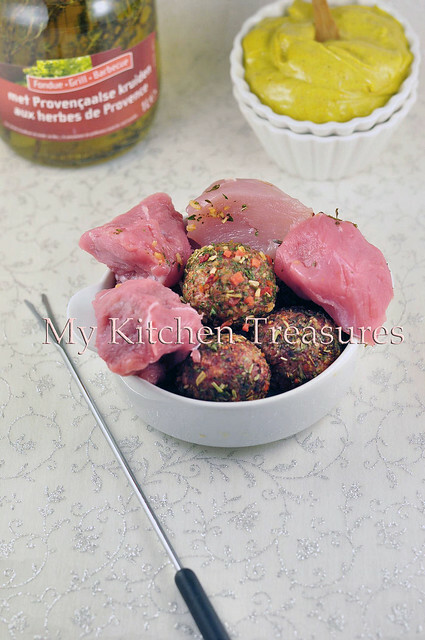 I love the spice meat version done by yourself! i have had chocolate fondue or cheese fondue... this is new! How interesting, I've never come across this. Being in India, I'd worry about whether the meat is cooked well enough - it takes a long time here to cook through. First time,seeing the savoury kind of fondue..Luv the meat balls.. I love chocolate fondue Finla..never tried other things..looks pretty..
first time on ur space but i never had pork..other than chicken and fish...i saw ur recipe the presentation is awesome..